Cruise the streets of the famous Las Vegas, at night! 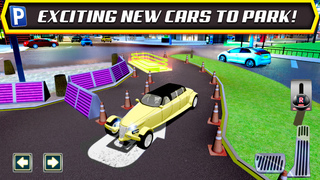 Prove your Parking & Precision Driving Skills in a huge selection of exotic Sports Cars, Stretched Limos and even bring in the tourists in 2 different Tour Busses. Drive some of the most expensive cars in the world in Las Vegas. Choose from executive sedans, sports cars and muscle cars, crazy long stretched limos, fast supercars and tour busses and even become the Sherriff of the Town – but remember kids… don’t gamble your hard-earned prizes away! Park your passengers and VIP’s at various famous Vegas hotels and destinations around the town. Can you pass every mission without denting the cars? Las Vegas at night is a real sight to behold! Marvel at the excessive use of electricity to power the city, in full gloriously animated Technicolor HD graphics! ▶ 75 PARKING MISSIONS: Go for GOLD on Every Level!